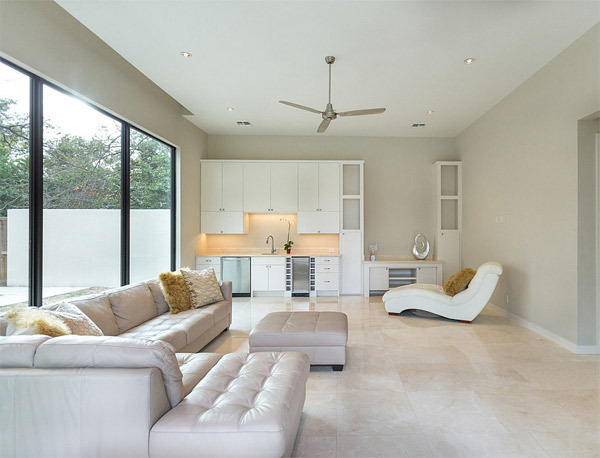 Every time that I’m asked of what design I want for my house, the very first concept that would come across my mind is that I want a house which defines a structure with clean architectural lines and shapes. It means that all spaces and angles are strongly defined by a straight or geometrical design. And amazingly, a house like my dream home will be featured today. Let us try to explore this house especially if you want a similar concept with mine. 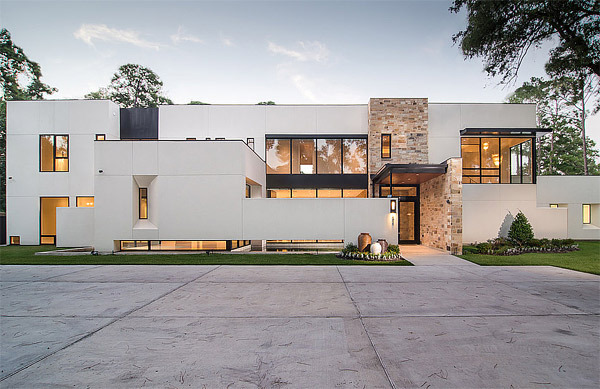 This contemporary house is owned and was designed by a family that once lived in Mexico and now permanently lives in Houston, Texas. The architectural approach of this dwelling was enthused by the contemporary design of their pervious home. The house is greatly structured with a geometrical, functional and open space plan which solely creates a private living environment. 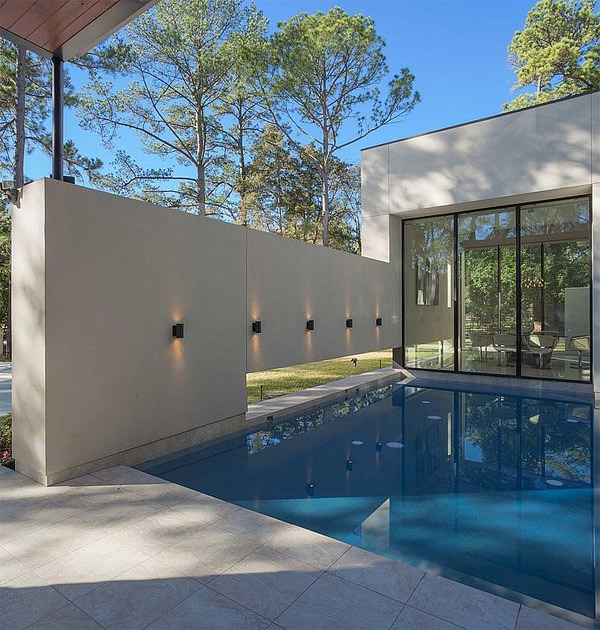 A glass wall is what this house makes up allowing reflection from the pool which is situated around the spaces of this home. More so, simple contrast of textures and colors were used all over the area to provide an interconnected ambiance between outdoor and indoor spaces. 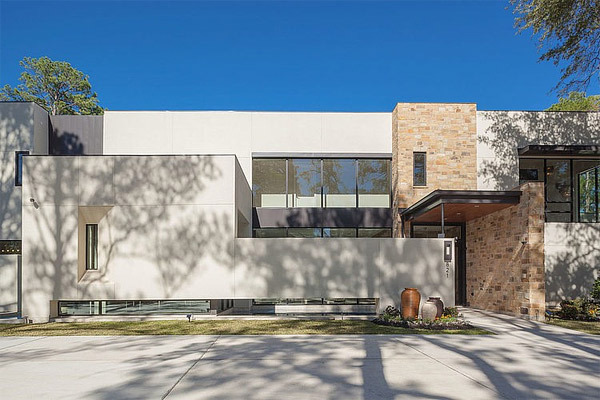 The facade of the house shows clean geometrical lines and enhanced with the incorporation of glass. 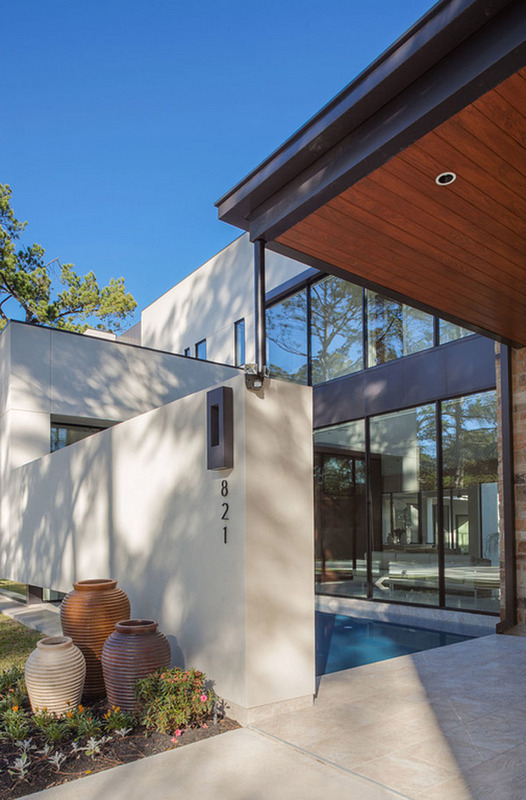 Since most of the walls of this house is installed with glasses, a panel board was used as a fence for the front facade to maintain privacy of the area . The entry porch is wide open and is designed with timber roofing. And as we enter its interior space we came across with this medium-sized pool. The beauty of the living room is enhanced with the use of bricks and glasses. A contemporary look was achieved by incorporating stylish sofa and a coffee table. As you can see their kitchen looks very elegant added with a breakfast table to complete its purpose. 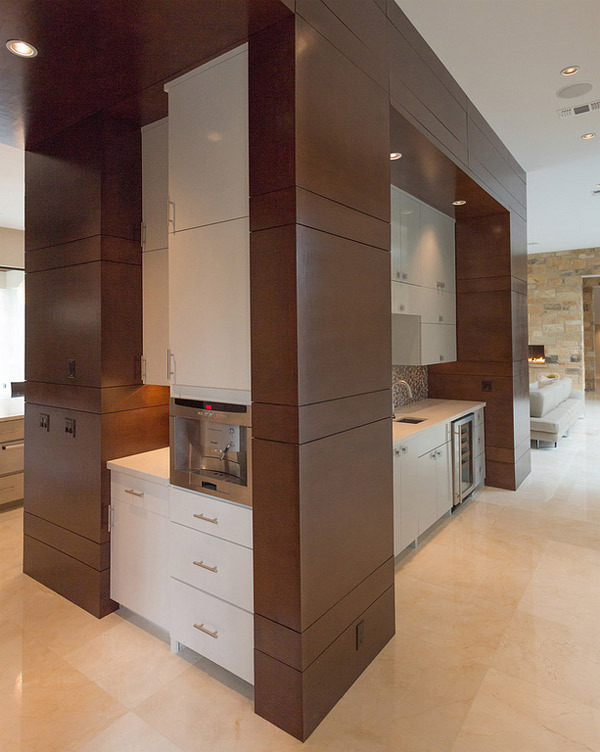 This divider houses two kitchen, they are set up back-to-back providing purposes for the breakfast table and the dining room. This is the other side of the kitchen facing the dining table. It is installed with series of storage cabinet to keep the area organize. I love the design of this dining room. 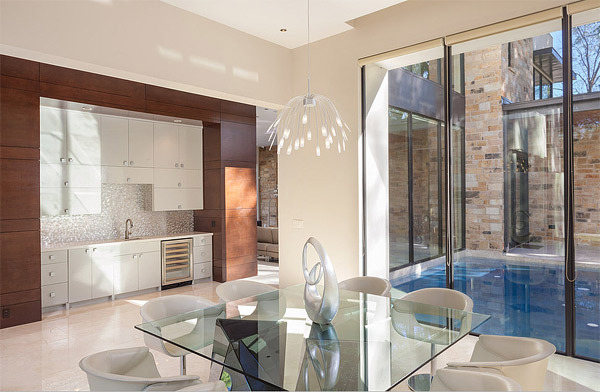 It looks very elegant, surrounded with glass walls and accustomed with a square glass dining table. This serves as the family room. A very spacious and functional space, furnished with comfortable couches and a kitchenette. 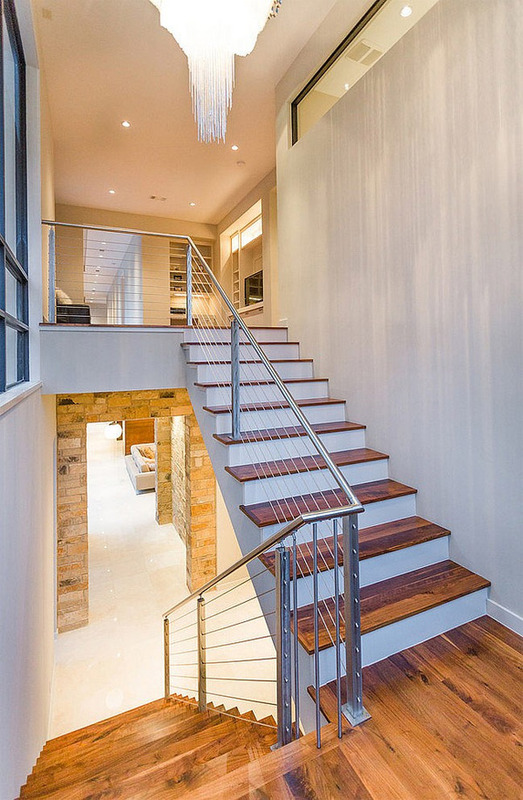 The staircase is made with wooden steps and steel railings that give out a sophisticated look. 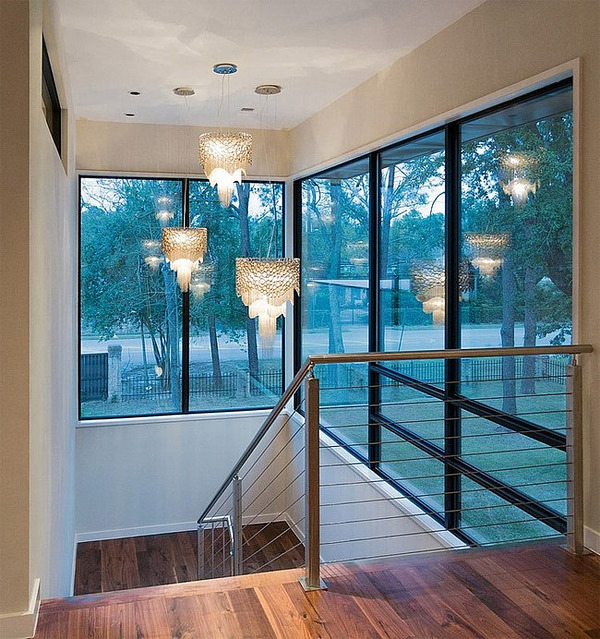 I can say that chandeliers illuminate spaces and give a grand effect in any area of a home. The bedroom just got a simple yet stylish design. The suspended headboard gives an elegant impact to the bedding. The bathroom is furnished with a two-piece countertop sink and at the corner is a bathroom vanity. 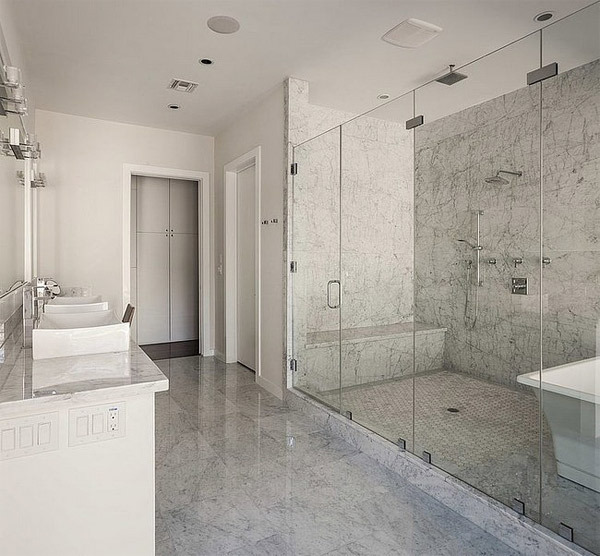 The shower room got a wide space where the shower area and the bathtub are placed together inside a glassed space. The open door serves to be the walk-in closet. The back of the house provides a variety of entertaining spaces like the pool and Jacuzzi. It has also a small covered patio wherein the roof serves as a balcony above. You can see how beautiful this house is when lights and the fire pits are lighted. All I can say about this house is – WOW! I’m greatly in love with this concept and most importantly, the house is made with more than enough spaces to provide a functional purpose for huge get-together with friends and families. It was a great job for 2Scale Architects in creating a classy structure.